I had been hearing rumblings about this film ever since it was about to hit the festivals. Knowing it was from the same duo who brought us the excellent and better than you'd expect You're Next, you can say I was very excited. To top it off, this wasn't going to be another horror film, which is what you'd expect from some talented filmmakers who knocked it out of the park with their last home invasion horror film. Nope. This time around they decided to head on into action/thriller territory and let me say, it's another home run. The Guest is an excellent piece of Badass Cinema. 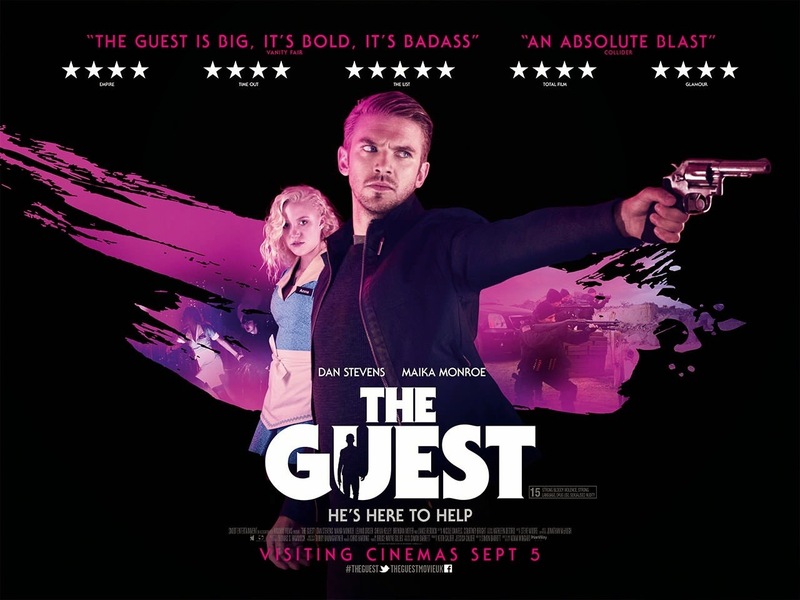 Everything from it's slick visuals, the incredible synth score, and it's somewhat 80's vibe, The Guest delivers the goods on all fronts, all in no small part to the incredible turn by lead Dan Stevens, who I'd never heard of before until now. Heralding from England, the guy plays one badass mofo, yet so damn charming that you can't help but like him, even though you know something is lying just beneath the surface waiting to explode. You see, right from the beginning, you know not all is what it seems with this guy, and it's his portrayal of a down home country boy looking after the family of a recently deceased fellow combat friend that kind of throws you for a loop. As an actor, he's got the southern thing down pat, and it's pretty remarkable. His ability to charm, shock, and frighten you all in the blink of an eye is what makes this film so impressive. A soldier shows up at the door of a fallen soldier's family one day. Claiming to be friends with the deceased soldier, he says that he was told to look after the guy's family. Almost immediately upon his arrival, the mysterious and charming soldier seems like a Godsend. He's handy, and a problem solver, helping every member of the family out in one way or another. But there's something mysterious about him, something just beneath the surface. The Guest is a solid entry in the action/thriller genre. Director Adam Wingard and writer Simon Barrett take a nostalgic approach to this film, making it look and feel like it came right out of the 80's, and these guys are quickly becoming the duo to keep your eye on. The Guest is an excellent film all around and an awesome piece of Badass Cinema. With the recent box office release of John Wick, it seems that stylish thrillers are coming back to the forefront once again, after laying dormant for what seems like forever now. I will put it on my must watch list, thanks!